The May issue of The Champion, magazine of the National Association of Criminal Defense Lawyers (NACDL) contains an essay by Popper & Yatvin partner, Alan L. Yatvin. “How can you represent those people?” In three decades as a criminal defense attorney, I had heard that question many times — at cocktail parties and from prosecutors, police, victims, law students, and once even from a judge. It comes with the territory. I understand that people accused of crimes are often automatically condemned, while their lawyers are regarded with contempt. However, as I walked along that steamy January afternoon, I was shocked by the source of the question. This time it was my wife, Laura, prompted by a just completed hour-long audio tour of a former fruit orchard on the outskirts of Phnom Penh, Cambodia. We were at Choeung Ek, the most infamous of the killing fields of the Khmer Rouge. It was there that Pol Pot’s regime executed 20,000 people. The victims were those suspected of connections with the former government or foreign governments, as well as professionals and intellectuals, members of various Cambodian ethnic groups and, in a cannibalistic frenzy, even regime members accused of some act of disloyalty. The Khmer Rouge death toll from starvation, sickness and execution has been estimated at two million. At Choeung Ek, men, women and infants were slaughtered night after night as martial music blared to cover their cries, and then they were buried in mass graves. Initially, Laura had not wanted to go to the killing fields. We were on vacation in Southeast Asia, there were many beautiful and exotic places to see, and she knew the story of the horrors of this chapter of Cambodian history. But as we were planning our trip, a friend said, “You have to go. It would be like going to Israel and not going to the Holocaust Memorial at Yad Vashem, or skipping the Anne Frank House in Amsterdam.” I insisted that the visit was necessary to understanding Cambodia and its people today. This was actually my second visit to these killing fields. I had been there 18 months earlier while in Phnom Penh on business. Along with my work as a Philadelphia criminal defense lawyer, first as a public defender and then in private practice, that visit was part of the reason for Laura’s surprise question. 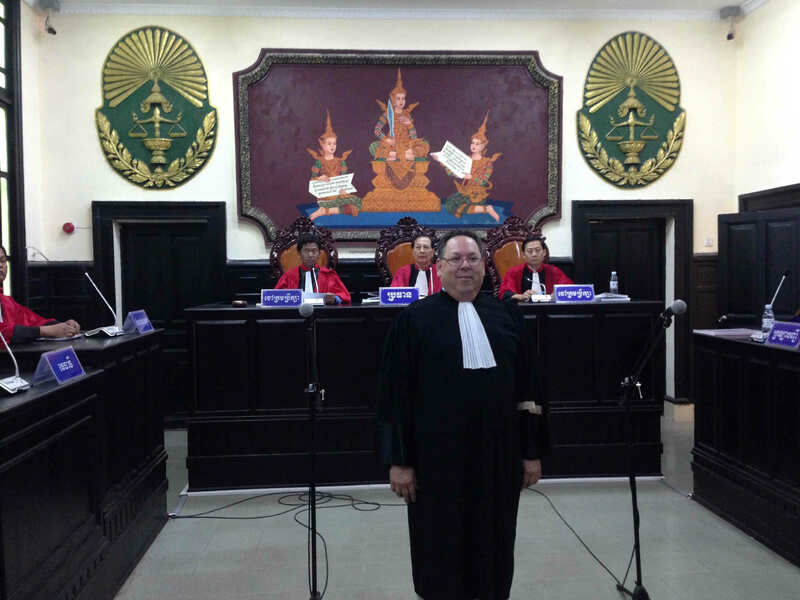 I had been in Cambodia as appointed interim counsel for a suspect before the Extraordinary Chamber of the Court of Cambodia (ECCC), also known as the Khmer Rouge tribunal. My elderly client was a former military officer. That was not my first war crimes case. In 2006-2007 I spent 18 months flying between Philadelphia and The Hague, where I represented an accused Bosnian Serb before the United Nations International Criminal Tribunal for the former Yugoslavia (ICTY). The ICTY prosecutor had described my client as being perhaps the person most individually responsible for killings in the entire Bosnia conflict. He changed counsel before trial, where he was convicted and sentenced to life in prison. Thus, this was no stranger at a party expressing shock and distaste for my profession. This was someone who well knew the nature of my work and had lived with it, and me, for decades. Since we were just beginning our three-week vacation in Cambodia and Laos, we had plenty of time to discuss the matter. Criminal defense is a significant, but not exclusive, part of my practice, which also includes representing victims of police misconduct and children with disabilities. The reality of my core criminal defense practice is that some of my clients have committed a crime. Yet all too often they have been charged with crimes disproportionate to their conduct, their prosecution has been procured by illegal or unconstitutional police conduct, or overzealous prosecutors are seeking excessive or inappropriate punishment. Sometimes my clients are just plain innocent. Often, I have no idea whether they committed a crime. I represent “those people” because all people must be ably represented by lawyers who do not judge them or decide their guilt based on their own views; otherwise there is no justice. 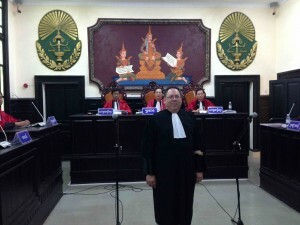 The hushed courtrooms of the federal courthouse across from Philadelphia’s Independence Hall and the high-tech courtrooms of The Hague’s tribunals are a world away from Cambodia’s killing fields. But it would be a betrayal of the memory of those buried in that now peaceful orchard to allow a legal system, a government, or the mob to decide in advance that some are so guilty that they are unworthy of the legal protections and representation those victims were denied. Pol Pot supposedly said: “Better to arrest 10 innocent people by mistake than free a single guilty party.” My mandate as a criminal defense lawyer is precisely the opposite, as expressed in this statement attributed in various forms to Voltaire, Benjamin Franklin, and Sir William Blackstone: “It is better that 10 guilty persons escape, than that one innocent suffer.” My wife, at least, now understands why I represent those people, even in Cambodia. Before entering private practice, Alan Yatvin served as an Assistant Philadelphia and Federal Defender. He concentrates his practice in criminal defense in state and federal courts, police misconduct litigation, and representation of special needs students. He is a director of the American Diabetes Association. © 2017, National Association of Criminal Defense Lawyers™ (NACDL®), All Rights Reserved. Yatvin co-counsels suit against New York Department of Education on behalf of students with diabetes.